While Tom's thoughts on management and technology are always worth reading, there are even more interesting parts. 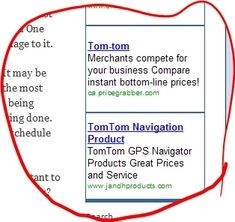 Tom gets great ads from Google's AdSense. You have to love a company called TomTom. Glad to know the AdSense doesn't miss a trick. Tom, ask for cut!